It has been revealed that nearly half a million more people in Britain are using electronic cigarettes as people opt to use the devices as an aid on the road to helping them quit smoking, according to fresh research. Action on Smoking and Health (ASH) reported that there are now 2.6 million ‘vapers’ in Britain, a figure that has risen up from an estimated 2.1 million in 2014. A Smokefree Britain Survey led by YouGov and analysed at King’s College London reveals that nearly fifty per cent of those using e- cigarettes are doing so to assist their want to stop smoking tobacco entirely. Those who have started using e-cigarettes in the last year are almost exclusively former smokers. The proportion of ex-smokers using the devices has risen from 4.5% in 2014 to 6.7% in 2015. Of the people in the survey, smokers and ex-smokers provided a number of reasons for turning to e-cigarettes. 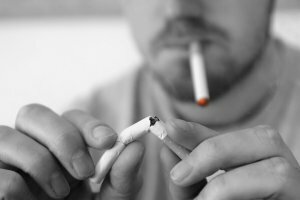 Among current vapers, 61% of ex-smokers said the foremost reason they were doing so was “to help me stop smoking entirely”, with 53% saying it was “to help me keep off tobacco”. From users who were still smoking, 43% revealed it was “to help me reduce the amount of tobacco I smoke, but not stop completely”, while 41% saying it was to “help me stop smoking entirely”. 25% of those who were continuing to smoke at the same time as using e-cigarettes said they were using the devices as they needed something to help deal with situations in the workplace, or in social situations such as bars and restaurants where smoking isn’t allowed. The results showed that the added incentive of saving money compared to smoking tobacco was named by 38% of ex-smokers who had switched to e-cigarettes too. Image: TBEC Review under Creative Commons.